Make cities more resilient and livable, and build support for nature through the development of green infrastructure and natural solutions to pollution. As our urban spaces continue to grow in density, we are faced with challenges that we can address in concert from Seattle to Shanghai. Bringing nature back is a key approach to making our cities healthier and more livable. When you start reimagining what a space could be without pavement, then you can start seeing opportunities for how the space can be used in a way to benefit people and nature. Two local public schools just received funding to support gardens at their school, improving their local environments and providing a local laboratory for environmental-science education. 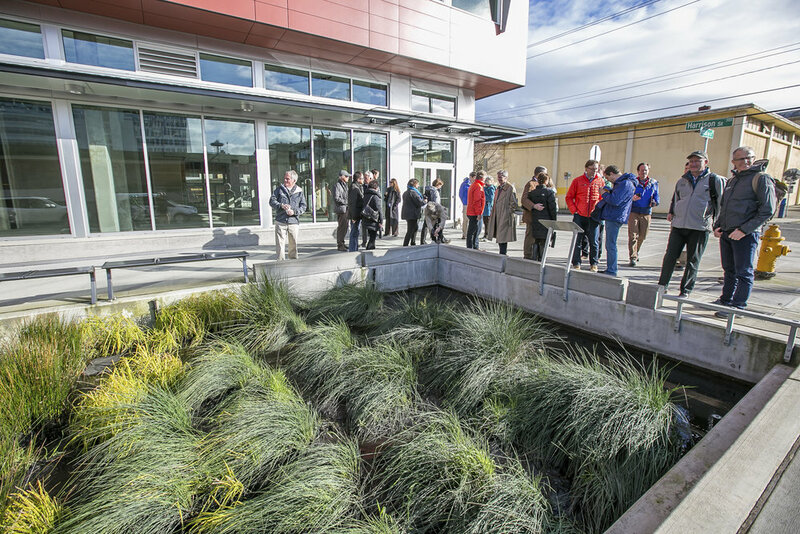 Stormwater management is one benefit of a new rain garden at Seattle's Pathfinder K8 — a stronger community is another. Our Salmon Are Choking on Toxicants — What's the Solution? We need to work together to begin solving the challenge of stormwater pollution to support the health of freshwater and marine ecosystems, including salmon and people. Involving youth in environmental projects gives students the opportunity to experience the outdoors in new ways and become advocates for nature. It is going to take an effort from all of us to take action on climate change’s impacts — from the top down and bottom up. Trees and a healthy urban canopy are an important tool in our toolbox. In addition to leading our work to clean up and restore Puget Sound, Jessie Israel is our chief architect for advancing our work in urban areas. Chris Hilton is the urban partnerships director for The Nature Conservancy’s Puget Sound program. Hannah Kett is the Puget Sound Cities Program Manager, working collaboratively with those on the ground to increase access to nature. Courtney is the conservation coordinator for the Puget Sound team at The Nature Conservancy in Washington, supporting both the Cities and the Water team. "Estuarine and aquatic ecologist. Following water from snowcaps to whitecaps." In many regions of the nation and world, rainfall poses a particular, important challenge: polluted stormwater runoff. As we seek to address the challenge of improving water quality, we have an opportunity to use the innate qualities of nature to boost health and wellbeing. This report provides a new perspective that merges recent innovations: nature for water management and nature for human health. Dive deep into this milestone report from The Nature Conservancy and learn more about the benefits of cities where people and nature thrive. The health and financial benefits of nearby nature from Kathy Wolf and research partners. We partnered with Washington State University to share their research on how to solve stormwater issues affecting our region. Puget Sound is a unique place to forge a new vision for facing climate change. A snapshot look at the state of the science from the University of Washington's climate impacts group. New research shows that trees communicate with one another and share nutrients through their roots! They need each other. In urban areas, trees also help us with health, economic and social benefits. They are part of our culture. We need them. So, how can we return the favor? Find out what stormwater issues mean for Puget Sound and how we plan on solving it! What is the natural habitat of humans?